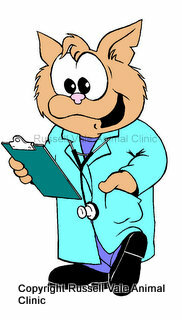 Dr Liz... the vet from Russell Vale Animal Clinic: The Musings of Dr Liz - Follow up, Follow up, Follow up! The Musings of Dr Liz - Follow up, Follow up, Follow up! Follow up! Follow up! Follow up! (to the sounds of the carnivals "Roll up Roll up Roll up"
Take your pet in for their "Follow up" vet visit, for the best treatment plan for your pet. Vets have medications, we have advice (great advice if you ask me). We have your back (to coin a phrase). Your vet wants you to "follow up" with them, so we can make sure that everything is going as well for your pet as we like to think it is. And if there is anything not quite right, we can nip it in the bud early! There is no point telling your best friends cousin that your vet didn't fix your pet's problem - go back to the vet. We need the follow up to know that what we are doing works, and definitely, if what we are doing doesn't work, so we don't repeat that mistake again. A quick email, or txt message to your vet may be enough, but usually a physical, hands on, face to face recheck is often the best. Remember, it is cowardly to tell other people that vets didn't fix a problem, but not let the vet know at all. I don't know if that has happened to me, as hopefully people can tell me to my face, but I do read posts of dog forums where that seems to be the case. A follow up may not be free, but if you really care about your pet, and the pet's of other people, then your vet needs to know if what they are doing is working or not. Thanks for reading, and I look forward to knowing what you think about rechecks at the vet - are they really necessary?